I don’t know about you, but I expect a lot out of our printer. With my husband and I both working from home, we are constantly printing out things, ranging to business documents to PDF cookbooks that were only available online. For me, I especially love to print out pictures of recipes. Maybe I’m crazy but I associate recipes by pictures. Of course, for great looking pictures you don’t just need a quality laser printer but quality laser printer office paper as well. Luckily, we have one brand we have trusted years when it comes to printing job that matter – Hammermill! Looking for amazing printer paper to help make your images stand out? 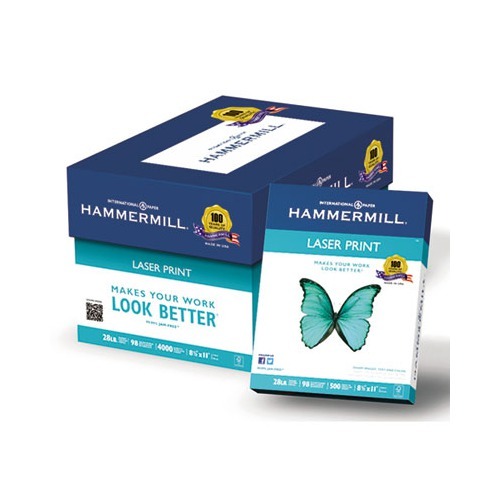 If so, we think you will love using Hammermill ‘s Laser Print Office Paper. This high quality laser printer paper has a super smooth surface that produces amazingly sharp images up to 2400 dpi! The radiant white shaded, acid-free paper is designed to make presentations and your projects look crisp, clean, and perfect for showing off in a boardroom or your own home. Best of all, the paper is made using wood from certified managed forests, giving you a greener option when it comes to your paper needs. As someone who loves artwork, I was very eager to test out this paper. One of the things I have learned over the years is that thicker, shinier paper is better if you plan on displaying your own work or want something nice to give out to perspective clients. This paper has a nice, heavy feel and durable enough that you will have no issues with it jamming in your printer, especially if you are planning on printing on both sides of the paper. Overall, this paper lives up the quality I expect from Hammermill and planning on purchasing another rim of paper before I go to my next conference for handing out copies of my media kit. Really, I consider this paper a must for any small business, especially if you want quality paper on a small budget. 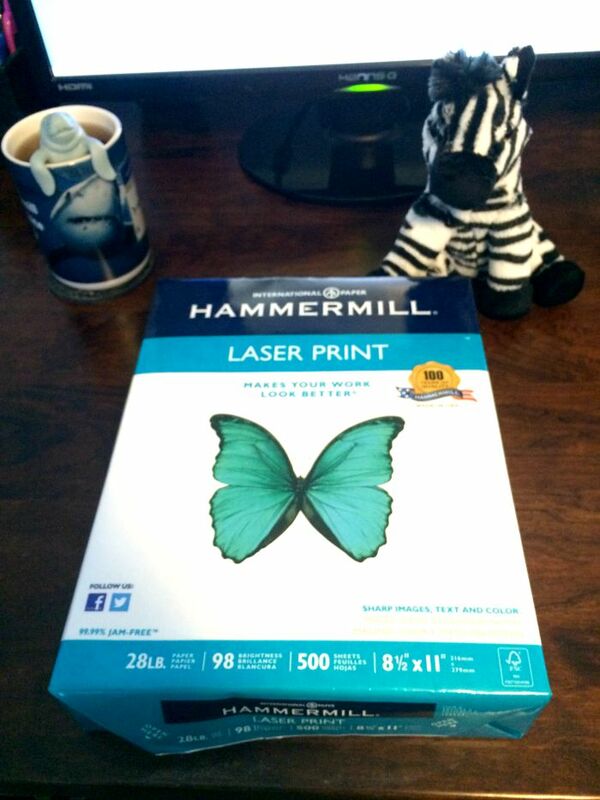 Based on my own experience, I am happy to give Hammermill Laser Print Office Paper an A rating. Want to purchase this awesome paper for your own household? 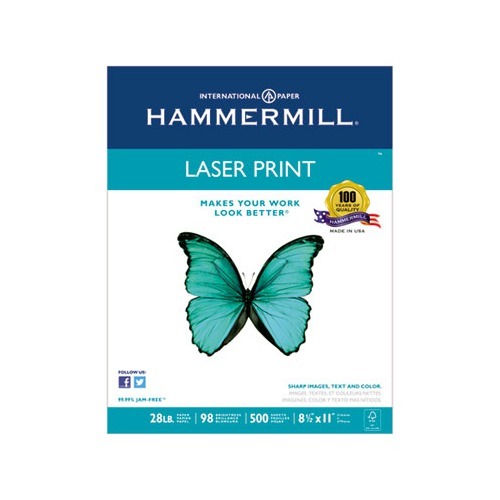 You can find Hammermill Laser Print Office Paper on Shoplet for only $13.85 a ream. While you are taking advance of this amazing deal, don’t forget to check out their great selection of other office supplies, office furniture, cleaning supplies, and even medical supplies! Make sure to check out Shoplet today! I like that it won’t jam the printer. I usually print on just one side and even with that my printer gets jammed and its the worst. Especially when you are in a hurry. Thick and shinny like you said is important when giving out information to perspective client or wanting to make a good impression. Thanks for your review. I just use what I can get on sale real cheap.No income here except for ODSP!Barely covers essentials! Sounds like good paper! I am always (ALWAYS!) printing stuff off! I don’t use the printer but I imagine that you would want to use good paper. Especially being work related you don’t want the paper jamming up or smears. It’s about time for me to stock up on paper. Will have to give this brand a try. I like bright white paper. Documents are easier to read and text looks more crisp. I will have to try Hammermill.